Hjärnstorm is an independent journal of art, literature, philosophy, and contemporary debate. We publish essays and articles on current trends in the present, art submissions by international and Swedish artists, and contemporary literature from the country’s best writers, along with new translations. Four issues of the magazine are produced each year. Each release is a unique experience: the participating authors read their texts, an art project is discussed, and sometimes we have a panel discussion on the theme of the issue. 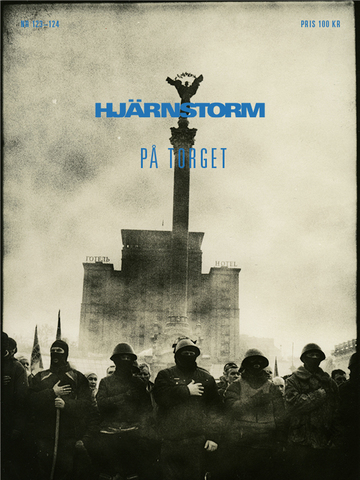 Hjärnstorm’s exhibitions are planned and curated by the editorial curator’s group under the name of Galleri Hjärnstorm. From 2003 to 2006 Galleri Hjärnstorm was a physical gallery space on Valhallavägen 138. Hjärnstorm is a collaborative endeavour of established artists and scientists mixed with those of debutant poets and young academics. Samlingsutställning med konstnärer som på olika sätt arbetar med frågeställningar om arbete, fritid och även tid som sådan. Samtliga kommer finnas med i ett kommande temanummer tema arbete. Vi har ännu inte valt ut medverkande konstnärer eftersom arbetet med numret ännu inte är färdigt. Urvalet kommer att göras av redaktion samt gästredaktören Frida Kringberg, konstnär med relationell inriktning.